At first I was expecting a slot from Playtech based on the excellent tongue-in-cheek US cartoon series based on a hapless secret agent. Alas, I was thwarted. In fact, Archer is based on that most famous of medieval archers, Robin Hood, who robbed from the rich and gave to the poor while parading through the English countryside in green tights. Parading all over 5 reels now, however, is the hooded man and his band of merry men and women. 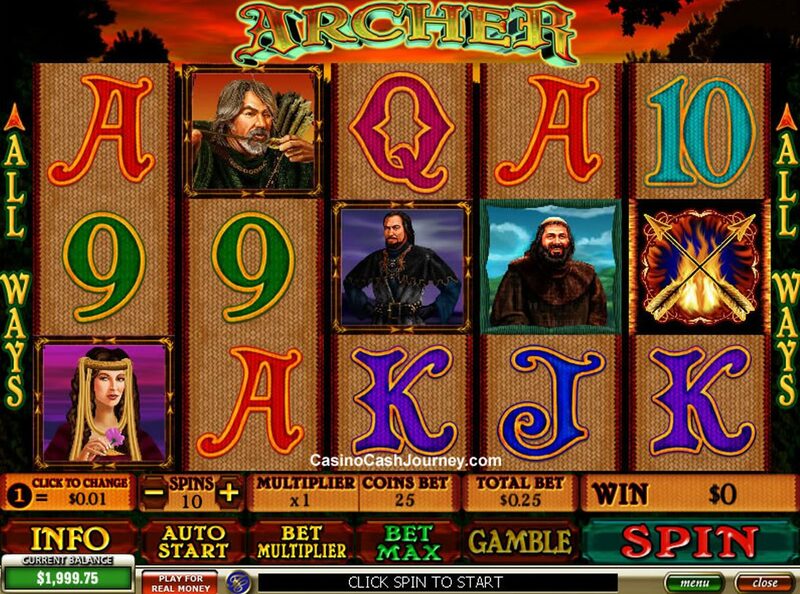 If you're familiar with the legends, you'll know the characters in the game: Robin Hood, Lady Marian, Friar Tuck, and the Sheriff of Nottingham, all accompanied by some medieval-styled 9-through-Ace symbols. The pile of gold is the Wild and appears on Reels 2, 3, and 4 only, substituting for all regular symbols in the game other than the Scatters. Three or more Arrow Scatters anywhere triggers a bonus round with 7 free spins. On top of the spins, you will earn multipliers anywhere from 2x to 50x on your bet. There's one more interesting feature in the game, activated when you land a winning combo including the Arrow scatter and an icon featuring the Arrow border. When this happens, the arrow border expands to cover the entire reel, as well as slicing its way across the game screen to make more winning combos. 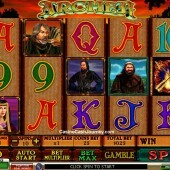 In terms of other medieval-themed slots around, check out Bally's Lady Robin Hood - which has a slightly different take on the Robin Hood tale by featuring a female heroine - and comes packed with stacked symbols and Wilds that substitute for all symbols. And while we're on tales of swashbuckling heroes from long ago, play Playtech's The Three Musketeers and the Queen's Diamond which has loads of lovely features and a real comic theme.